Perth Scorchers 7-140 (Paul Collingwood 38, Marcus North 37, Michael Bates 4-34) beat Auckland Aces 8-124 (Martin Guptill 36, Colin Munro 23, Michael Beer 3-13. Auckland Aces lost the most important match of their pool as they were outplayed by Perth Scorchers in the last encounter of the Champions League Twenty20. Perth Scorchers scored 140 runs with three wickets left after utilising the required 20 overs and Auckland Aces could extend their innings to 124 for the loss of eight wickets. 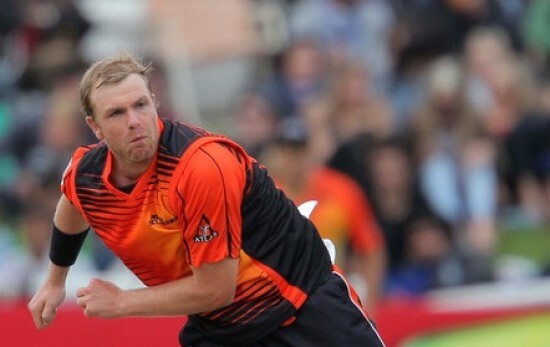 Michael Beer (Perth Scorchers) was declared ‘Player of the match’ for his excellent bowling spell of 3-13. The Champions League Twenty20 – Group A match was played on Tuesday, October 23, 2012, at Supersport Park, Centurion. Marcus North won the toss for his team Perth Scorchers and preferred to go for batting first. The decision bounced back as the wicket of their prominent opener, Herschelle Gibbs, was gone for just six runs as Simon Katich got together with North. The latter dispatched 3 fours in the fourth over and he maintained his aggressive attitude by hitting 1 six and 2 fours until the 10th over. Marcus North was run out on the last ball of the same over for 37 off 1 six and 4 fours. The second wicket was lost at 62 and five runs later, Simon Katich was clean bowled by Ronnie Hira for 21 runs. Paul Collingwood and Tom Beaton compacted the innings when that was badly required by the team. Collingwood threw the ball out of the rope almost in every over after his arrival at the crease. Beaton added 13 runs in the 16th over with 1 six and 1 four as the score board displayed the first hundred of the innings. The score touched up 118 in 17.1 overs when the stumps of Tom Beaton were dislodged by Michael Bates for 22 runs. Collingwood ran himself out while trying to enhance the run rate after scoring 38 off 27 with 5 fours. Perth Scorchers reached 140 runs for the loss of seven wickets after the completion of 20 overs. Michael Bates was the star performer by grabbing four wickets and Ronnie Hira claimed one wicket. Auckland Aces had a poor start while losing Lou Vincent for two runs on the nine balls he faced as Azhar Mahmood joined in with Martin Guptill. The duo kept the score board moving at a reasonable pace accompanied by occasional boundaries. Azhar Mahmood dispatched 3 fours in the eighth over off Collingwood and the first fifty of the innings was attained in the next over. The second wicket associated for 49 runs as the total reached 61 in 9.1 overs when Martin Guptill was caught behind by Luke Ronchi off Ryan Duffield for 36 off 32 with 1 six and 3 fours. The wickets started tumbling suddenly as Azhar Mahmood became the fourth victim after scoring 24 off 21 with 4 fours. Auckland Aces were struggling at 5-75 in 12.3 overs and the target looked difficult to be achieved. Colin Munro was the only batsman who exhibited some defiance and kept the hope alive for his team. He was the eighth batsman who went back to the dressing room for 23 off 18 with 1 six and 1 ball as the score touched 109 in 18 overs. The late order batsmen gathered just 15 runs in the last two overs and Auckland Aces managed 124 with two wickets left. Michael Beer was the highest wicket taker with three, Joe Mennie held two whereas Ryan Duffield and Brad Hogg shared one wicket each. Perth Scorchers won the match by a reasonable margin of 16 runs but both teams are out of the semi-final race while securing 6 points each.